Mascot Lorca trousers are reinforced with Cordura. Triple-stitched seams on the outer and inner of legs and at crotch. Ergonomic-cut legs for use with knee-pads. Two reinforced holster pockets in Cordura with area at the back for hip protection. Press studs for additional fastening of holster pockets. Mascot Trousers Lorca 04031-010 fabric: 65% polyester 35% cotton. Triple stitched for ultimate strength. Side pockets with extra strong lining. These trousers include hip pockets, one with flap. Double ruler pocket. Cargo pocket with mobile phone and pen pocket provides extra storage. Knee pad pockets with height adjustments. Tranemo 2820 work Trousers are made from 65% polyester / 35% cotton, twill with comfort finish, 300 g/m² fabric. The Caterpillar 1810010 Allegiant work trouser is a classic designed cargo trouser. Fully equipped with functional pockets for maximum utility, Contrast bar tacks at stress points and wide centre back belt loop. Left side bellowed cargo pocket and stacked cell phone pocket with hook and loop closure. Front reach in pockets with logo metal rivet, Back welt pockets with contrast bar tacks at stress points and Back right ruler pocket with pen pocket and contrast bar tacks at stress points. Extra wide centre back belt loop to keep belt in place, 18 inch leg opening to fit over boot. Dickies Eisenhower Multi-Pocket Trousers are premium polycotton canvas work trousers with knee pad pockets. It includes Cordura external knee pad pouches, two back pockets, one with stud fastening. Multi-pocket detailing with tool pouches for carrying a variety of items. Velcro adjustment on waist gives a secure fit. Dickies Eisenhower Work Trousers EH26800 Fabrics: 65% polyester, 35% cotton canvas, (soft against the skin, yet hardwearing) 300gsm. Polycotton comfort finish 300G fabric with triple-stitched stress seams for ultimate strength. Wide belt loops and additional bar tacking at all stress points. Heavy Duty Brass Zip Fly. Front Hip Pockets and 2 rear pockets. Double leg cargo pockets with mobile phone pocket. Ruler pocket on right leg with outside tool pocket. Tramemo 4820 High-Vis trousers are triple stitched for added strength. Excellent work trousers that are long lasting that can stand up to everyday use. Spacious front pockets provide extra item storage. These trousers include hip pockets, cargo pocket with extra pocket to carry tools, mobile phone pocket and loop strip for hanging tools such as a hammer. Manufactured from 52% cotton & Polyamide 48% to provide comfort and durability. Reinforced areas around the knees for improved wear and tear. Kneepad pockets ideal for the KneeGuard knee pads. Pockets include: One leg cargo pocket, Ruler Pocket, Two front pockets. Featuring CORDURA fabric details, built in knee pad pockets and reflective details, pull-out tool pockets, the Skilled Ops Trouser is highly functional for all seasons. Contrast oxford double layered articulated knee with top-loading knee pad opening and Hi-Vis reflective details at front and back knees for increased visibility. Diamond crotch gusset for ease of movement, contrast inside waistband with gripper tape which keeps shirts in and pants in place. Contrast CORDURA fabric panels on pull out pockets, knees and back scuff guards, CORDURA fabric increase the life of the pant. Cell phone pocket on left thigh with hook and loop closure, back right oxford ruler pocket with pencil pocket adds additional storage and accessibility for tools. Back patch pockets with darts and contrast oxford trim and carpenter loop on left hip. Fabric: 65% Polyester 35% Cotton Twill. Machine washable trousers on 40°C. They are designed to be very hard wearing with features such as reinforced belt loops and seams whilst at the same time very comfortable to work in. These trousers also have bottom loading knee pad pouches allowing knee pads to be inserted and removed easily. Work trousers are made from 55% Cotton and 45% Polyester fabric. The Bizweld Cargo trouser offers protection against the thermal hazard of electric Arc. Portwest BZ31 Pants guarantees flame resistance for the life of the garment. A range of ample pockets allow for convenient storage. This modern trouser has an elastic waist band for comfort and ease of movement. Amazing work trousers made in extremely comfortable yet durable Canvas+ fabric. Features an Advanced cut with Twisted Leg™ design and Snickers Workwear Gusset™ in crotch for outstanding working comfort. KneeGuard™ positioning system Kneepad pockets for superior knee protection. Cordura® reinforcements at the knees and inside the holster pockets for extra durability. Multipockets trousers with a range of pockets, including holster pockets and phone compartment. Easy-to-access leg cargo pocket with separate mobile phone compartment, Smart ruler pocket design with loose front corner for improved functionality. Manufactured from Canvas+, an extremely comfortable, rugged fabric: 60% Cotton, 40% Polyester, 340 g/m². Lightweight, scratch resistant, comfortable and hard wearing work trousers. Well designed with Roomy side pockets & Hip pockets. Additional tool pockets, Cargo pocket with flap. Double ruler pocket, Mobile phone pocket with a key ring holder. Tranemo 1120 Polycotton Cargo Pants Fabric: 65% Polyester 35% Cotton 245 g/m². Snickers Workwear 5457 Anti-Flame Trouser are hard wearing and reliable, complies to EN standard 531 safety standards. They include front crossover pockets for easy access with either hand; and a tool holder with Velcro fasteners for tool pouches or hammer holder. Integrated two folding ruler pockets with bellows and outer compartments and kneepad pockets. Top quality trousers and excellent value for money. 60% Cotton, 40% Polyester, 340 g/m². Snickers 3314 are just amazing work trousers made in Canvas+ fabric. They incorporate advanced cut with twisted LegTM design, GussetTM in crotch for outstanding working comfort with every move. Easy-to-access leg cargo pocket with separate mobile phone compartment and four pen/tool compartments, smart ruler pocket design with loose front corner for improved functionality and freedom of movement. Chino trousers with wide leg pockets, practical and functional. Feels like wearing your favourite pair of jeans. Left leg pocket with flap and Velcro closure and outside compartment for pens and small tools. Right leg pocket with flap and Velcro closure and outside pocket for mobile phone. Leo Workwear Bideford hi-vis cargo trousers have triple stitched seams for extra strength and durability. Made from 80% Polyester / 20% Cotton with a water and stain repellent finish. Reflective piping on the pockets, and cargo style leg pockets. Conforms to EN20471, Class 1 and is available in various sizes. Excellent hi vis polycotton worktrousers. Used in areas of low light. Tough and durable to keep you dry from the elements. Orange trousers are Railway Group Standard GO/RT 3279 certified. Leo Workwear Bideford hi-vis cargo knee pad trousers have triple stitched seams for extra strength and durability. Leo Workwear Bideford CT01 Hi-Vis Cargo Trousers conforms to EN20471 High Visibility standards. Excellent trousers that are used areas of low light. 3M Scotchlite reflective tape encircles the leg, ideal for night-time visibility. Leo Workwear Appledore high visibility over-trousers come with elasticated waist with shock cord adjuster. Side pocket access, large Velcro-fastened cargo pockets are great for soring your items. Lower leg zip opening with velcro-fastening storm flap give a tight, secure fit. Large Hook & Loop-Fastened Cargo Pockets. PU Coated Polyester fabric trousers with Side Pocket Access. Leo Workwear Appledore L01-Y Hi Vis Cargo Overtrousers Complies to ISO 20471 Class 1 safety standard. This provides a windproof, waterproof and breathable personal barrier. The reflective tape has also been upgraded to 3M Scotchlite. Complies to ISO 20471 Class 1 safety standards. Caterpillar Cargo Knee Pad Trousers made from hardwearing polycotton. This trouser offers bottom loading kneepad pockets,and pleat-fronted cargo pockets on the sides of each leg. As well as such wider Velcro-closing cargo pockets, the trousers have a pair of front 'chino' pockets, and two square-cut rear pockets that are closable to offer extra security. There is a mobile phone compartment and a knife pocket sewn into the fabric. Made from 80% Polyester & 20% Cotton with a water and stain repellent finish. Leo Workwear Bideford CT01 Hi Vis Knee Pad Pockets Cargo Trouser conforms to ISO 20471 Class 1 High Visibility standards. 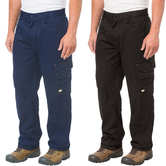 Mascot Toledo work trousers are a tough and durable pair of work trousers. They are made from hard weave polycotton canvas material. Carefully cut to fit ergonomically thus giving exceptional comfort. All seams are triple stitched for extra durability. Overall an excellent pair of trousers and excellent value for money. Adjustable braces with quick lock and elasticated waist. Front zipper with flap and velcro, high waist, padding on knees and snow protection with draw cord. Knife pocket with flap, spacious leg pockets with over flaps and velcro fastening. 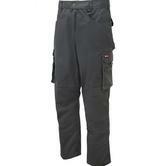 Hard wearing cargo trouser with holster pocket and knee pads inserts. Work trousers with triple stitched seams at stress points. Castle Clothing 711 Pro Work Trousers fabric: 65% Polyester and 35% Cotton, 330 g/m². 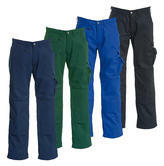 Cargo Work Trousers are typically loose cotton, multi-pocket trousers characterised by an external side pocket. Some wearers call them Combats or Multi Pocket Trousers. Either which way, we think they are the most practical working trousers available. We favour the Tranemo Comfort Plus Cargo pants because of their high quality, fit and comfort. 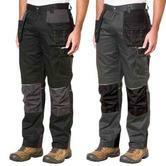 Our range of cargo pants extends to hi viz cargo trousers and overtrousers by LEO workwear. We also have Snickers FR or antiflame cargo trousers. Its hard to believe the excellent value of the Tranemo Black Cargo Pants. Many of our multipocket trousers feature knee pad pockets, such as the Premium Mascot Lorca, which has long wearing Cordura knee pad pockets. 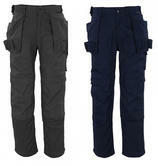 The CATERPILLAR C820 cargo troousers are premium cargo pants with bottom-loading knee pad pockets. Go on, take a look around! Our Good quality, functional cargo trousers are more than worth their price.